Building a website for a customer can take weeks and even months. A project, which was supposed to take 2 weeks can last a lot longer because of some trivial issues. With the Agency Plan, you can set a domain for your website, which doesn't have an active Premium Plan. This way, whenever you need to show your customer the project, you can send a professional link like customer1@agency.com. Adding an agency domain will make all your websites, which don't have an active Premium Plan, display under a subdomain of agency domain. New websites created in WebWave randomly get subdomains. With the Agency Plan, you can change it. 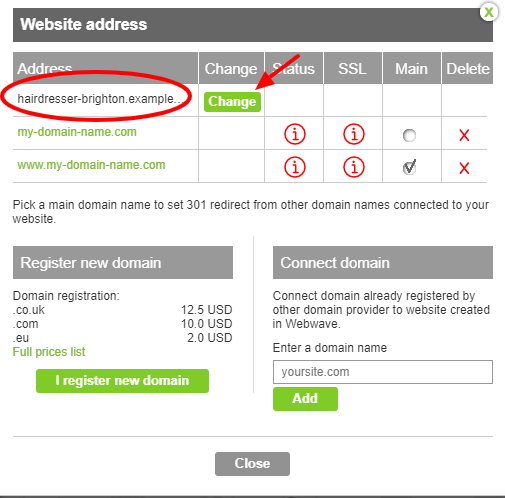 In Webmaster's panel enter "Web address". In a new window, you can set a subdomain.